Over the past weekend, Jim and I had to make a trip from the Grand Canyon to Page, Arizona to have some work done on our truck at the Ford dealership there. Because it’s the closest dealership to us, and because it’s about 150 miles away, we decided to go on Sunday afternoon and spend the night so we could be there when they opened. Eating in restaurants I have never been in before is difficult because I have to know that what I eat is gluten free. When you’re traveling and you’re trying to find gluten-free foods when you dine out, some cuisines are easier than others. 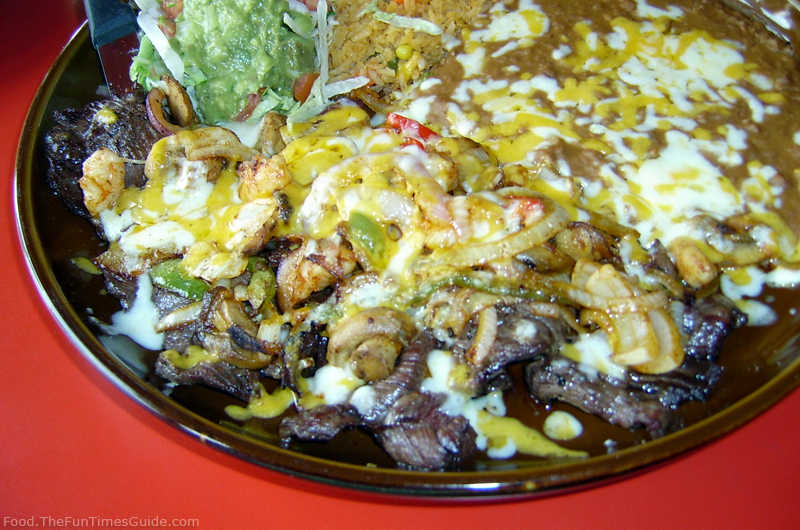 We wound up at a local Mexican restaurant called Fiesta Mexicana. Fiesta Mexicana was one of the best restaurants I have been to since we left south Texas! Sunday night we ordered Hongos Al Ajo, which is mushroom sauted in a garlic sauce. They were delicious, and more of them than the two of us could possibly eat. My dinner was Tampiqueno — flank steak cooked on the grill, topped with grilled shrimp, onions and peppers, then smothered in cheese. It came with rice, beans, and a guacamole salad. My meal was so good that I sent a tip to the cook, which I almost never do. Since they are also open for breakfast, we decided to go back to Fiesta Mexicana the next morning. Jim had Huevos Rancheros, a typical Mexican breakfast. I saw something I had never had before on the menu, so I ordered Enchiladas Sincronizda. The description of it was "a stack of 3 corn tortillas, with a ground beef molcajate sauce, topped with fried eggs." It was accompanied by "Papitas Fritas" — little nuggets of fried potatoes with onion and peppers. Was it ever good, and every bite was gluten free! Another great find in Page, Arizona was Fred’s Liquor Store. I have been searching for Redbridge beer since we arrived in Arizona, with no luck, until this week. At Fred’s when I asked if they carry Redbridge, the very helpful clerk (Korina) said, "Yes we do." She went on to say that if I was buying it because I have to stick to a gluten-free diet, she also has a couple of Japanese rice beers. I wound up buying three 6-packs of Redbridge beer and one 6-pack of Sopporo beer. We only stayed in Page for one night. If we get to go back there in the future, you can bet I will be eating at Fiesta Mexicana at least once while I am there!